HOARD WORLD: MASTERS OF THE UNIVERSE DAY! Hoarding awesome stuff my entire life so YOU didn't have to! MASTERS OF THE UNIVERSE DAY! This is how Trap Jaw and Fang Man celebrated MOTU Day this year. I bet you've been crossing off dates on your wall calendar, counting down the sleeps and waiting feverishly in anticipation while looking at a clock. I bet you thought the day would never arrive. Well, it finally has and that time is NOW. It's Masters Of The Universe Day! 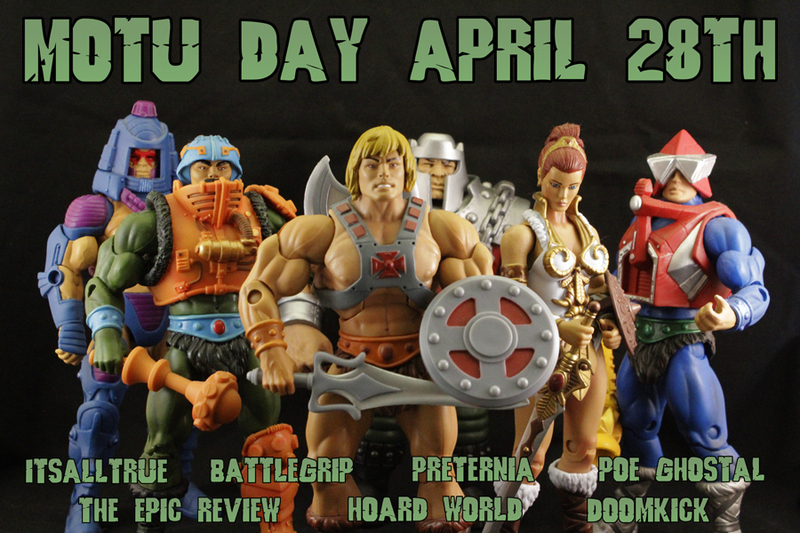 I know there's three or four of you out there that are wondering what MOTU Day is? That's ok. Don't be alarmed, embarrassed or even ashamed of yourself. We're all friends here. Theoretically. So it was declared, so it shall be done. Forever and ever. He-men. But what are you supposed to do on Masters Of The Universe Day? There were some people out there who did the only thing any right-minded MOTU FAN could summon up the energy to do. They BLOGGED. Oh, how they blogged. They blogged the Stinkor out of it. ...people what done blogs about MOTU on April 28th 2013 and stuff. 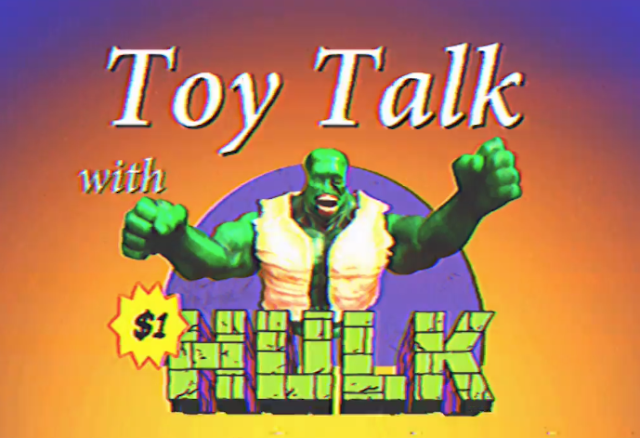 ItsAllTrue.net talk about He-man. All of the He-man. It's quite good. You should read it after you read this. The fine folk at DoomKick (who had the bright idea of reviving MOTU Day for the people and spearheaded this cross-over) have done not ONE but three MOTUC reviews covering Skeletor, Battle Armor Skeletor and Snake Face (whom I still haven't received in the mail yet because I live off-planet). Preternia give Fang Man a going over with some fantastic pics. Battlegrip has more MOTU-related content than you can poke a Power Sword at and The Epic Review takes a walk down memory lane with their Top 5 MOTU-related memories! I also have it on good authority that the infamous Poe Ghostal is taking a long, hard look at Jitsu. But what about lil' ol' me? How did Hoard World spend MOTU Day? Great question. Glad you asked. I took it upon myself to embark on some investigative journalism and find out how some of The Masters Of The Universe actually spent today. It's become a public holiday over there on Eternia so many of them took the day off their regular job of Mastering The Universe to have some down time. Trap Jaw and Fang Man had a wonderful picnic together. Great minds must think alike because it was only just the other day that Catra and Chief Carnivus also had a nice, albeit slightly more romantic picnic which was captured by paparazzi and posted over on Hunter Knight's Facey B.
I now know what the producers of Deep Impact felt like when Armageddon was announced. Or vice versa. Sometimes The Zeitgeist is not your friend. As beautiful a day as it was, the mosquitos and ants were totally out of control and the picnic was cut short. King He-man and Ram Man love to play a bit of Eternian Football on MOTU Day. You might notice that an Eternian Football looks spookily similar to the green egg from the major motion picture Flash Gordon. Ram Man and King He-man both had no comment when questioned about the uncanny resemblance. I'm not sure what the rules to Eternian Football are. As far as I can tell, one player stands there and holds the ball for a long time while the other player stares at them. I can't be entirely sure who won. Not a lot of people know this about Jitsu but he loves to rock climb. Why do you think he carries his equipment around with him ALWAYS. What? You thought those orange things strapped to his back were weapons? Oh no. If you thought that, you would be wrong Sir/Madam! Jitsu is all about the rock climbing. He spent all of MOTU Day doing it. He's particularly slow at it. I didn't stick around to see if he made it or not. He should stick to just chopping things with his over-sized hand and growing facial hair. Or going to sports matches and not needing his own giant foam finger. It wasn't all outdoor living and physical activity however. Zodac and Strobo had a bunch of laundry to get done. They had quite a backlog it seems. Strobo's cape was FILTHY. You'd think he could keep the one item of clothing that wasn't underpants, gloves or shoes clean but apparently capes get really dirty really quickly. Good to know. I'm not sure Zodac should have washed his cosmic armour though - I'm pretty sure it said, "dry clean only" on the tag. I also have no idea which one of these guys own the cut-off denim short shorts and game show host jacket. We all know Skeletor was busy all day posing for DoomKick's Reviews (although Fang Man and Jitsu both had photo shoots and they still had some free time. Maybe it was all the costume changes?) but what did Beastman choose to do while his master was away? He caught up on his reading. He was less than impressed when I walked in on him. Wait'll he sees this on the internet! Clawful got a new fish tank for his collection of flesh-eating fish and decided to feed them. Merman isn't particularly happy with anyone (even Evil Warriors) keeping sea life in captivity so he usually stops by Clawful's place to make sure he's looking after them properly at least. These visits are often quite challenging. "Whoa! Whoa! Whoa! They're allergic to DUCK!" "You sure about that Fish Face?" I hope you enjoyed coming with me on this journey behind-the-scenes of MOTU Day. I hope you have a good one - whatever it is that you do. AT EASTER, NOBODY CAN HEAR YOU EAT CHOCOLATE! RECYCLED MATERIAL: MASTERS OF THE UNIVERSE CLASSICS LIGHT HOPE FIGURE by Mattel. VALENTINE'S DAY featuring EXCLUSIVE tips from TV's Bryan Cranston of Breaking Bad fame. EXCLUSIVE: VINTAGE AUSTRALIAN TOY CATALOGUES FROM THE 80s AND 90s! HOARD WORLD PODCAST GUEST SPOT MAY 2018! 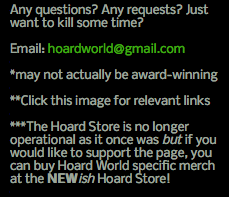 All photos/text unless otherwise credited were taken/written by HOARD WORLD. Copyright 2012-2019. Awesome Inc. theme. Powered by Blogger.